This may be a stupid question to ask, and maybe I will be chastised for not doing the research myself, but recently I have been having doubts on the validity of Ngram charts. Let me explain where my misgivings lie. First, in the American corpus, does it contain only American publications. Would a Charles Dickens novel, for example, never show up in its results? 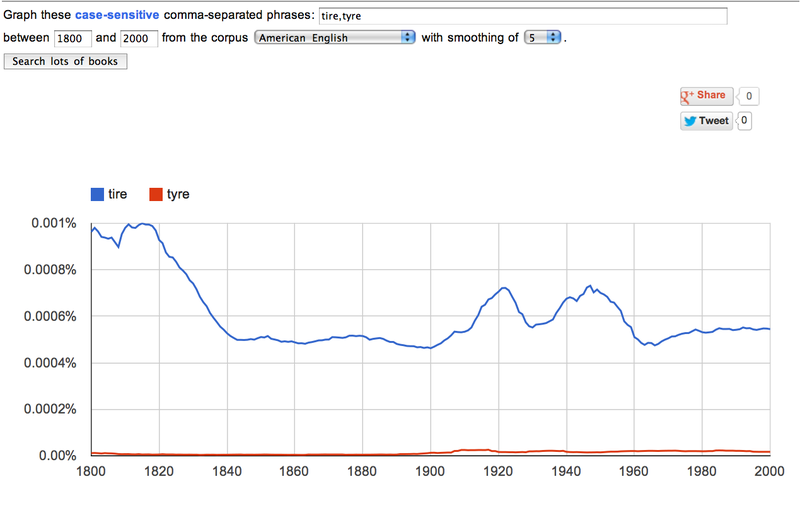 Second, how reliable is Ngram for showing the difference between AmEng and BrEng spellings and language usage? For example, I saw these charts in tchrist's posted answer to How and when did American spelling supersede British spelling in the US? Well, did tires or tyres (as in auto-mobile wheels) really exist in 1800? What I believe we are seeing is the verb, to tire. (EDIT: Many thanks to @Mario Elocio who pointed out that tires existed in 1800 but were made of iron, not rubber.) And how reliable would the chart be in any case if we typed humor vs humour if Google books included quotes spoken by American and British speakers in novels? I have the same doubts concerning the British corpus, would a J.D. Salinger novel or even a quote from "Catcher in the Rye" never appear in the British corpus results? If books are published in both countries which have different copyright laws (if I recall) then wouldn't both corpora include those texts? EDIT On ELL @Matt has posted this Ngram on his answer to: What is a word for “very slow”? I think this is a perfect example that illustrates that Google Ngram is unreliable for certain tasks. This diagram cannot illustrate whether one expression is more widely spoken than another. What it seems to be telling us is that the expression "glacial pace" has recently become more frequent. Despite Matt having changed some of the searched words (this is version B), I still don't understand the scope of this Ngram. Am I missing something? re AmE vs BrE: Dickens is published in the US and UK. Most popular authors will be in both. Check out the ngrams info for the source of the publications. 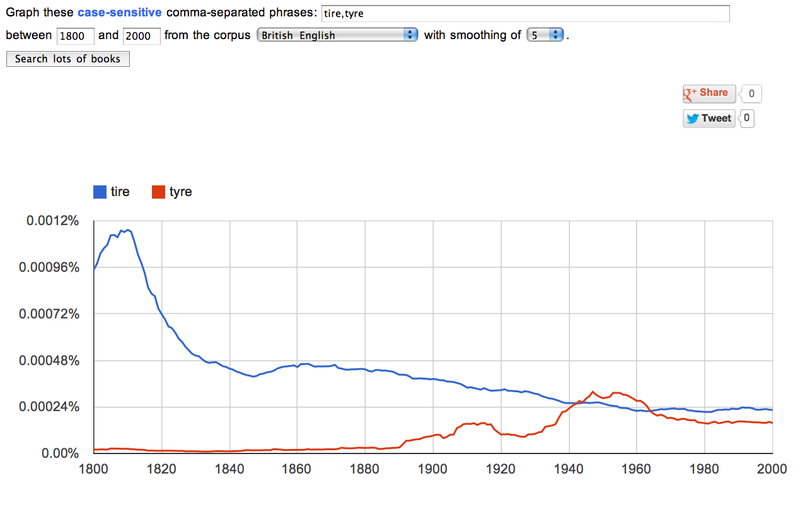 re speech vs print: ngrams only captures those things that have been printed in books, not transcribed speech. So lots of spoken slang, nuances if pronunciation, regional varieties are sparsely represented and even when so have all sorts of orthographical issues. The advice is to use ngrams with caution and always look atthe actual results rather than just blindly following the graph results. NGrams is a great tool but it shouldn't be used blindly. The tire / tyre example would be heavily confounded by tire as in become tired, and to a tiny extent by places in Lebanon and New York (wp), as well as the iron tyres mentioned in the comments. So that serves as an example of how ngrams can easily fool or be fooled. Is it proper to create a referring duplicate question for the purposes of SEO?